We are delighted to share a blog written by Dongho Shin, a student at The British School, Warsaw who is part of a team delivering a Global Goals project for the 2018-19 Global Goals Competition. We cooperated with local charity to have a Saturday special school. Children of the charity were invited and we had lesson with them in English. 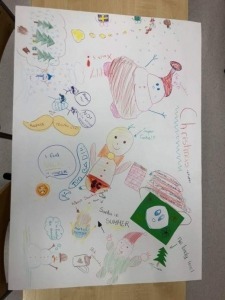 We were writing letter to Santa Clause, playing dodge ball, basketball, reading books and had special Christmas lesson. It was pleasure to have fun with local polish children. I have improved in organizational skill since nothing was done for us and we had to organize everything on our own. I found out that i like teaching people. I taught Wojtek who was the participant of the Saturday school. I felt a strong sense of achievement as Wojtek understood what i was teaching him and finding it interesting. Sure. Whatever the experience is, I believe that it will benefit you. You will be able to develop skills that you never had a chance to. Also, isn’t it great to volunteer for making a world better place? I invite people of my age to get involved in similar projects!! Green Warriors@GIIS ECC Bee Green!